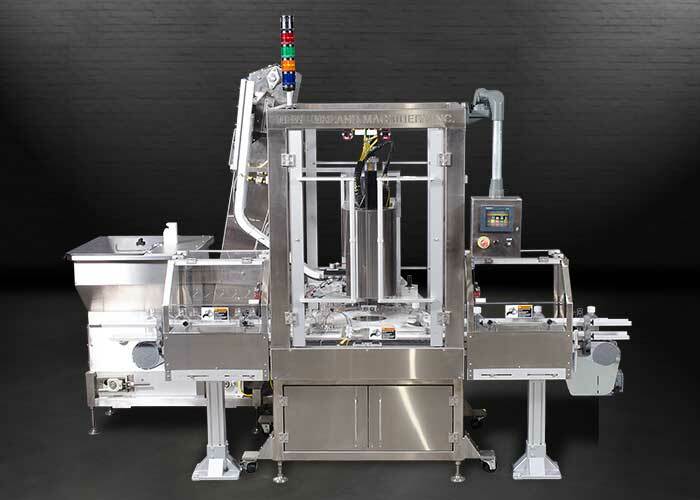 New England Machinery’s highly accurate Single Head Capper provides positive, straight and secure chuck cap application to a wide variety of caps and containers. The New England Machinery, Inc. intermittent motion NESHC is designed to prevent cap or thread damage as a result of over-torqueing. Our electronic torque control offers consistent and repeatable applied torque. Adding the servo motors allow positive applied torque control through recipe settings in the HMI. The closed loop system gives feedback to the controller. Cappers with the servo option utilize a programmable electric cam, which stores container and cap parameters in the controller memory. The values can then be recalled via recipe selection in the HMI. All Servo motors are options, not on the base model.